Vicki Schulte, Program Manager for Community Living, got a call from her sister. She’d found an apparently healthy lost dog that didn’t seem to have an owner. “Do you want to adopt?” she asked. Barbi was very excited to get a “doggie” when Vicki discussed it with her. They waited five days without any response from an owner. So Vicki’s sister invited them out to pick up the dog. Unexpectedly, the owner turned up. 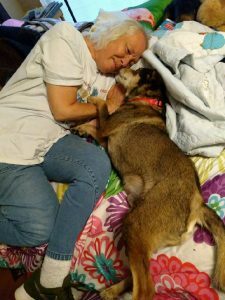 While dog and owner were happy about the reunion, Barbi was heartbroken. Thus began a search for the perfect dog for Barbi. Certain criteria had to be met. The ideal dog needed to be a rescue, a senior dog (sorry puppies!) that is housebroken and gets along with cats. The perfect dog had to enjoy walks, but be relaxed enough to be a lap dog. And the rehoming fee had to be reasonable. While Vicki and Carrie put out feelers all across Missouri (and even some neighboring states), Barbi was not content to wait. She was ready to go meet some candidate dogs in person, right now. To help with the wait, Vicki and Barbi visited the Central Missouri Humane Society. Barbi checked out several dogs, including a fuzzy white-haired dog whose fur matched Barbi’s white hair. Unfortunately, that dog’s adoption was already in the works. Then Barbi spotted HiWay. He was named for the spot where his previous owners found him as a pup. HiWay made an instant connection with Barbi. He followed her everywhere she went at the shelter. He never left her side. He was ready to go to his new home immediately! His previous owners simply didn’t have time for him anymore. But HiWay is a good dog in every way. He’s 11 years old and has a grey muzzle. Vicki and Barbi filled out the adoption papers and returned the next day to visit. The sweet dog greeted Barbi with a wagging tail. She was elated to see him. HiWay was able to go to his forever home with Barbi on September 6th. He has brought so much joy into her life and the lives of her roommates. Barbi gave him a new home and a new name. She renamed him Rusty. He’s been a welcome addition to the family. Welcome home, Rusty!